The most outlandish idea in the Marvel cinematic universe yet, ‘Guardians of the Galaxy’ promised us tree people and talking raccoons with lots of humour and badassery in the mix. What it delivers is sadly not quite up to the level we wanted, but it has just enough humour for it to stumble over the line, overcoming a few grating scenes and overly cheesy dialogue to come out of the other side a pleasant distraction. 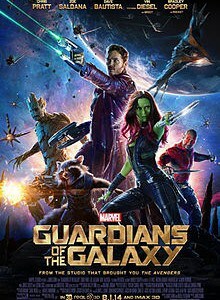 The thing is that despite its outlandish premise and well-drawn world that features some brilliant scenery, James Gunn’s film succumbs too often to out of place sentimentality and needlessly over the top celebrations of camaraderie that would barely entertain even the youngest of the film’s audience to be a genuine revelation. What it does have on its side is pretty good comic timing and character dynamics that serve to be entertaining and watchable if never fully exciting. The revelation of the film is most definitely Dave Bautista, whose performance as Drax the Destroyer is the funniest and best delivered of all the characters. It may be the case that Bautista has been given the best lines to work with, but he still has to deliver them well, and he definitely does, producing most of the laughs. As a professional wrestler for WWE one would naturally expect him to be a little deficient in the character actor regard, but as well as being amusing, Drax feels like more than just comic relief, and that’s Bautista’s doing. The rest of the cast suffer from unfortunate inconsistencies, being entertaining one minute and irritating the next. This is very true of Chris Pratt in particular, whose character Peter Quill is by turns amusing and annoying, and whose chemistry with his fellow characters also veers wildly, with some conversations feeling terribly wooden and some of the more sentimental moments being so phoned in they could possibly induce vomiting with a little more cajoling. The same is true of Bradley Cooper’s Rocket, but it must be said that Vin Diesel’s performance as Groot is also a quiet success, who knew the words ‘I Am Groot’ could mean so many things, even if the film does contrive to ruin it a bit by the end. ‘Guardians’ is a bit of a disappointment then. Thankfully it has enough about it to still make us thankful for its sparks of originality and wacky outlook, even if parts of the film just don’t work. It certainly manages to get a few laughs out of us, and cinematographer Ben Davis’ visuals are definitely worth watching, but it feels like Gunn needs to take another look at the film and maybe give it a few edits or another cut because of its regular inconsistencies, both in tone and in terms of action and drama, where in this case the action is most definitely stronger. By no means the best film in the Marvel Cinematic Universe, but a fun if slightly underwhelming ride nonetheless.